This small bookshop in Bratislava, Slovakia, has a climbing wooden floor that allows it to double up as an informal auditorium. In the daytime these chunky wooden steps provide seats for anyone having a leaf through the books, while during events and talks they can be filled with rows of spectators. 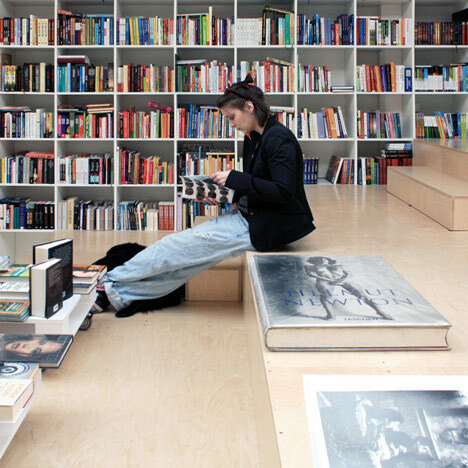 Completed by Slovakian architects Martin Jančok of Plural and Aleš Šedivec of Totalstudio in 2010, the bookshop also contains a coffee shop at the floor’s peak. A staircase here leads down to staff rooms and storage areas that are concealed below. One of our most popular stories of all time features a bookshop inside a former church - see what you think here or see all our stories about bookshops here. How can a small bookshop compete within a network of firmly established booksellers? What can it offer to customers? How can it draw attention? Our aim was to create a flexible space that would not only sell books but would also be capable of facilitating various collateral events such as projections, readings, minor concerts, workshops, etc. Two focal points of the bookshop are placed at both ends of the longitudinal space. A checkout is next to the entrance and a coffee bar is on the opposite side on an original elevated gallery. Both levels are connected with cascades which serve as an auditorium during collateral events and allow customers to sit, read, relax or communicate through regular opening hours. Books are stored in long shelves along both sides of thebookshop. By this means a clear oragnization and a monumental effect is achieved. New titles and bestsellers are displayed at several mobile stands. The permanent part of the program - storage, deposit, office and lavatory – are placed under the gallery and accessible via a staircase at the edge of the coffee bar and cascades.